For 35 years, Josip Broz Tito held Yugoslavia together despite its mix of nationalities, languages and religions. After his death in 1980, simmering ethnic tensions resurfaced, eventually leading to the wars in the Balkan states. 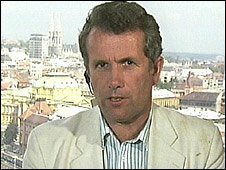 Former BBC correspondent Martin Bell returned to the region to examine Tito's legacy. His power once held Yugoslavia together under the banner of brotherhood and unity. But now his memory divides it - or the many republics into which it has disintegrated. Thirty years after the death of Josip Broz Tito, there are still some Serbs, Croats, Bosnians and others who describe themselves, rather wistfully, as "Yugo-nostalgics". The country wielded an influence beyond its size. It successfully played off one superpower against the other, and was one of the leaders of the non-aligned movement. When the man who was Yugoslavia died in May 1980, the list of mourners at his funeral read like a roll call of world leaders. And yet there are others who blame him for the wars that tore the region apart some 11 years after his death. Having reported those wars myself, I have tried to trace their origins while retracing my steps through Bosnia, Serbia and Croatia, talking to Tito's comrades in arms and to some of the politicians - new and old - including Stjepan Mesic, who stepped down in February as President of Croatia. I also spoke to Tito's youngest grandson Andre who, like Mr Mesic, is proud to be a part of the new Croatia. 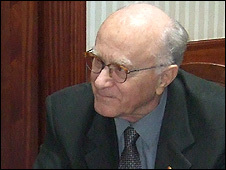 But one of the primary witnesses was Raif Dizdaravic, now in his 80s, whom I met in the cavernous coffee shop of the old Hotel Europa in Sarajevo. 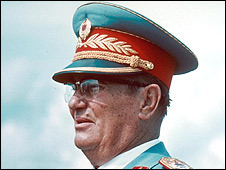 Once an officer in Tito's Partisans he was Yugoslavia's foreign minister, speaker of its parliament, and then one of the rotating presidents after the dictator's death. He was there at the beginning and there at the end. Mr Dizdaravic believes that the seeds of nationalism were sown in a new constitution in 1974, which loosened the federal structure without introducing necessary economic reforms. Politicians in the richer republics harvested votes by wondering aloud why they should subsidise the poorer ones. He told me: "When we actually decided to move towards decentralisation, we were not giving time to the economy. Instead we were giving time to the republics." The old flags and anthems were banned under Tito, but out of sight did not mean out of mind. The dream of One Yugoslavia fell apart under the pressure of this resurgent nationalism. I remember some of the fiercest battles of the war in Croatia were fought on the so-called Highway of Brotherhood and Unity. In the war in Bosnia, they were fought on the Bridge of Brotherhood and Unity in Sarajevo. In most countries of the former Yugoslavia, little has been done to safeguard Tito's legend and in Serbia many of the statues and the Marshal Tito streets have disappeared. 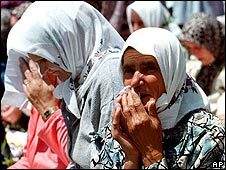 One of the effects of the Bosnia war especially - which cost 97,000 lives over three years - has been the separation of its peoples. Muslims, Croats and Serbs - who used to live alongside each other - mostly do so no longer. This is the politics of identity. Sarajevo is now identifiably a Muslim city in a sense that it was not when the war began. More mosques are in it now, say the Serbs, than in Tehran. The Bosnian Serbs in their mini state, with its capital in Banja Luka, are determined to save the separate status conferred on them by the Dayton agreement in late 1995. It was Dayton that brought an end to the war but produced a constitution that was a recipe for deadlock. The Bosnian government, under the leadership of Haris Silajdzic, is pressing for something closer to a unitary state. Both Serbs and Croats feel threatened. One of the outcomes is that there is hardly a functioning government at all. Elections are coming and that means playing the nationalist card yet again. Some Bosnian Serbs are threatening a referendum on independence, a breakaway state on the model of Kosovo. But no-one would recognise it. And Bosnia without its Serbs would not be Bosnia. Stjepan Mesic, the Croatian ex-President, has even suggested armed intervention to break the Serbian mini-state (the Republika Serbska) into two. Thirty years after Tito's death, there is not so much to celebrate in his legacy, except that the wars are over. Bosnia, Serbia and Croatia are not mutually hostile states, although their entangled histories weigh heavily upon them. They all aspire to membership of the European Union, which might over time blunt the edge of nationalism and return to them that sense of a "national space" which they have not had since the death of Tito and the fall of Yugoslavia. Martin Bell's two-part series The Rise And Fall Of Yugoslavia - The Story Of Tito will be broadcast on Monday 26 April and Monday 3 May at 2000 BST on BBC Radio 4 and will be available for seven days after that on the BBC iPlayer.